Key role in cellular energy production. Derivative form providing greater neuroprotection. ¤ Brain cells communicate with each other because they are connected by long nerve filaments called neurites (axons and dendrites). As the brain ages, it loses many of its neurites, which leads to reduced efficacy and slowing of most cognitive processes. ¤ Acetyl l carnitine arginate is a superior molecular combination of the amino acids acetyl l carnitine (the acetylated form of l carnitine) and l arginine. A number of studies show that acetyl l carnitine arginate is extraordinarily effective at stimulating growth of new neurites - by up to 19.5% after five days. In comparison, acetyl l carnitine by itself stimulates such growth by “only” 5.6%, while a combination of acetyl l carnitine and l arginine taken separately achieves a growth rate of 5.2%. According to this study therefore, acetyl l carnitine arginate is almost three and a half times more effective, in terms of neurite growth, than arginine and acetyl l carnitine taken separately. ¤ The same study shows that the average length of the neurites in the group stimulated by acetyl l carnitine arginate was 21% longer than those in the control group. ¤ Acetyl l carnitine arginate may also protect brain cells from toxicity caused by beta-amyloid, found in abundance in the brains of Alzheimer's patients. 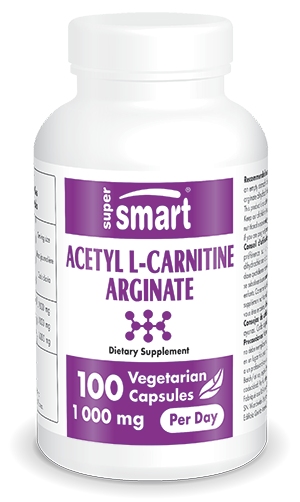 Acetyl l carnitine arginate generally increases the neurotransmitter content of brain cells and helps maintain both their optimal morphology (size and shape) and their proper state of differentiation (specialization). Acetyl l carnitine has been one of the most popular neuro-nutrients with our customers for many years. Several animal and human studies support the multiple benefits to the brain of this exceptional nutrient. With the discovery of acetyl l carnitine arginate, these benefits are now even greater. There is also another patented form of carnitine called L-carnitine tartrate. They all have the advantage of being active and bioavailable to the body. This is also one of the reasons why carnitine supplements are very popular with sportspeople, as are certain essential amino acids such as branched-chain amino acids (leucine, isoleucine and valine). Each vegetarian capsule contains 500 mg of acetyl L-carnitine arginate dihydrochloride.